Join Us for free Yoga in the Park this summer! Nil is certified at the 500hr level from Yoga Works, NY. She also holds Restorative yoga certification from the same school. With intensive training at the Iyengar Institute of Nil travels regularly to India to train with the Iyengar family. 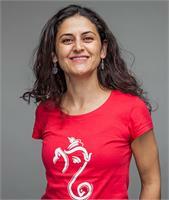 Nil is also a practitioner of “lazy men’s yoga” Thai Massage which she got certified in Chiang Mai, Thailand in 2009. As a teacher, Nil always encourages her students to practice to their fullest potential and believes that continuous effort and personal commitment is key to find the union between body, mind and soul. WELCOME TO THE YOGA ROOM FAMILY! From beginner to advanced, whether you are looking to relax and unwind, or build strength and flexibility, a friendly community awaits to support you. With two spacious locations featuring over 200 classes a week (including Hot Yoga, Vinyasa Flow, Restorative, Pilates, Pre/Post Natal, “Barre Fit” & Aerial Yoga, we believe there is a place for you at The Yoga Room. TO GET IN THE BEST SHAPE OF YOUR LIFE, TRY TRX, ROWING OR SPINNING CLASSES AT WORKOUT FACTORY, QUEEN’S PREMIER BOUTIQUE FITNESS STUDIO! OUR EQUIPMENT PILATES PROGRAM FINALLY HAS ITS OWN NEW HOME. COME JOIN US – DO PILATES, IT WORKS! New to The Yoga Room? Get your first class free on us!